Police violently repressed activists protesting the nearly irreversible damage done to the Middle East’s largest salt lake over the weekend. This image was taken of a protest earlier this year. Like a chain of dominos, citizen protests are erupting everywhere: following the Tunisian and Egyptian revolutions catalyzed in part by skyrocketing food prices, political protests have swept throughout the Arab world. But it hasn’t stopped there, and not all battles are political. In Jordan, ordinary people are protesting government plans to include nuclear power in its arsenal of energy sources, while in the United States, Bill McKibben and other well-respected community members, including Jim Hansen from NASA, have been arrested for marching against the Keystone XL Pipeline – a carbon bomb that climatologists say would officially end the battle against climate change (humanity 0 vs. climate change 7 billion). 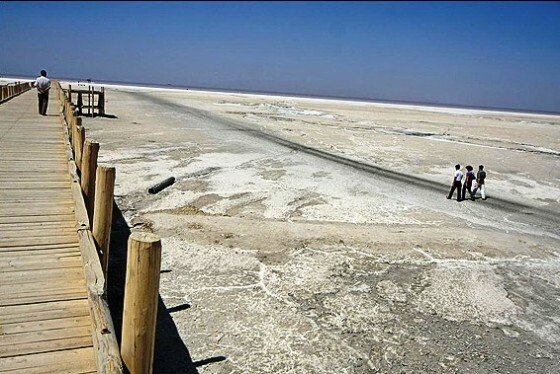 But none of these latter environmental events has garnered such an extreme response as the Lake Orumiyeh protests in Iran, where bloggers report that people are being arrested, beaten, and in some cases tied to trees for protesting the slow death of the world’s second largest salt lake. In part because of drought and in part because of poorly managed dam construction and irrigation projects, Lake Orumiyeh or Urmia in Northwestern Iran has shrunk to roughly 60% of its original size. Once a mecca for flamingos and other wildlife, the dying lake now more closely resembles a dusty moonscape. 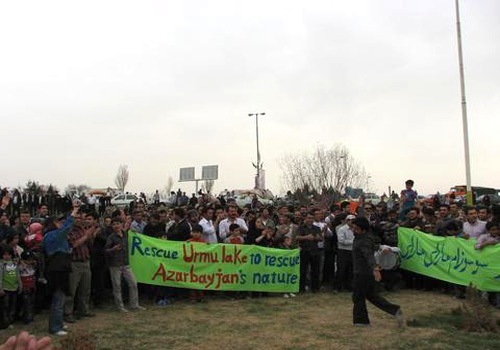 Residents in Azerbaijan that rely on the Ramsar protected site for their sustenance claim that Revolutionary Guards are responsible for shrinking lake levels and the subsequent rise in salinity and decrease in biodiversity. Global Voices claims that if Lake Urmia dries up completely, millions of people will have to settle elsewhere. Spurred on by these concerns, thousands of protestors spilled into the streets of Tabriz and Urmia last weekend in order to put pressure on the government to step up conservation efforts. But eyewitnesses report that protests quickly took an ominous turn. According to one blogger, Urmuiscielli, policemen beat and arrested protestors, some of whom were tied to trees. Although the police crackdown was censored in the mainstream Iranian press, Iran’s Independent Press picked up the story, and the blogosphere was populated by video footage and calls for other citizens to support Azeri activists and re-launch anti-regime demonstrations. If taken seriously, the increase of environmentally-themed disputes between citizens and their governments, even in the Middle East, could spur a whole new era of accountability measures. Protestors who show little willingness to compromise until real action is taken have the power to disrupt the smooth functioning of society to such an extent that governments (a la Egypt) will have no choice but to instill effect change. And eventually, when environmental degradation is unequivocally linked to an increase in environmental refugees, green-minded lawmakers such as Polly Higgins, who has been campaigning the United Nations to make Ecocide a crime against humanity, will be better poised for success. Of course, none of this will happen in Iran anytime soon given that country’s oppressive regime and appalling environmental record, even though these protests show an increasingly emboldened (or desperate?) populace. Next Next post: Car Bodies and Windows As Solar Energy Panels to Recharge Lithium Batteries? Not Ramsar! This is Urmu (Urmia) lake, that is located in north western Iran (South Azerbaijan).